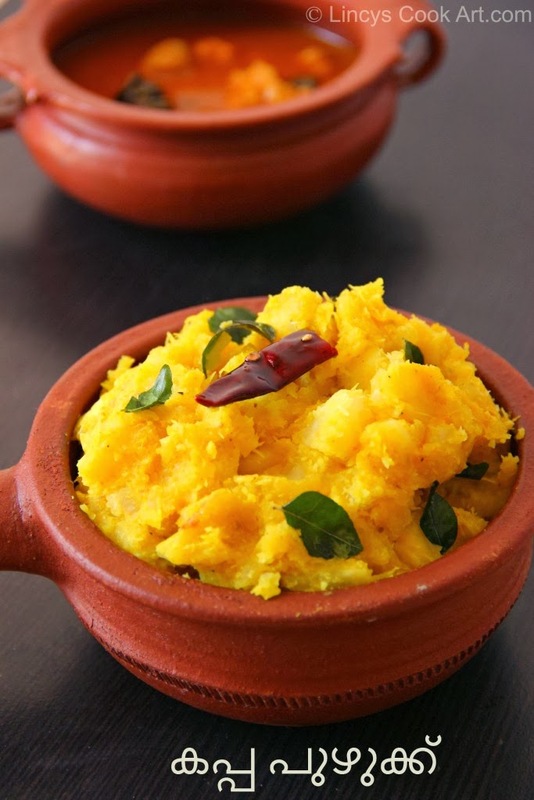 Kappa Puzhukku is a traditional dish of Kerala. Prepared in each and every home frequently. With hot and Spicy Fish curry (Meen Mulakittathu)or firey Kanthari chammanthi perfect combination. It is my favourite dish. I can eat this as a lunch /dinner or as a snack. This is a dish, mom cooked often. I kind of really missed when I was in hostel. Whenever I use to come back home, she used to prepare it frequently for me. Boil some water to rolling hot in a deep pan add the tapioca pieces with some salt. Cook till it cooks to a soft consisitency but not mushy. Drain the excess water and allow it to cool. In a pan heat oil and add green chillies and fry for a minute. Then add the curry leaves and dry red chilli. Fry and switch off the gas. Lightly mash the tapioca pieces and keep in a pan. Add the ground masala, turmeric and some water around half a cup. Cook this mixture till the raw garlic and turmeric smell leaves. Add the fried curry leaves and chillies in this mixture. Cook for two three minutes and switch off the gas. Adding peppercorns in this recipe is optional. Green chillies you can add while grinding also or while frying. If you add at the time of grinding colour may slightly change. Looks wonderful and love the colors and Pots! Super yummy dish to try..looks very delicious. Kappa Puzhukku is such a favourite of all Keralites. After reading your recipe and viewing beautiful pics, I feel inspired to recreate the dish from our home land. New to me, but very healthy and delightful. Really inviting presentation. Lovely dish! Looks so good!